Map of Bolivia, Ecuador, and Peru. 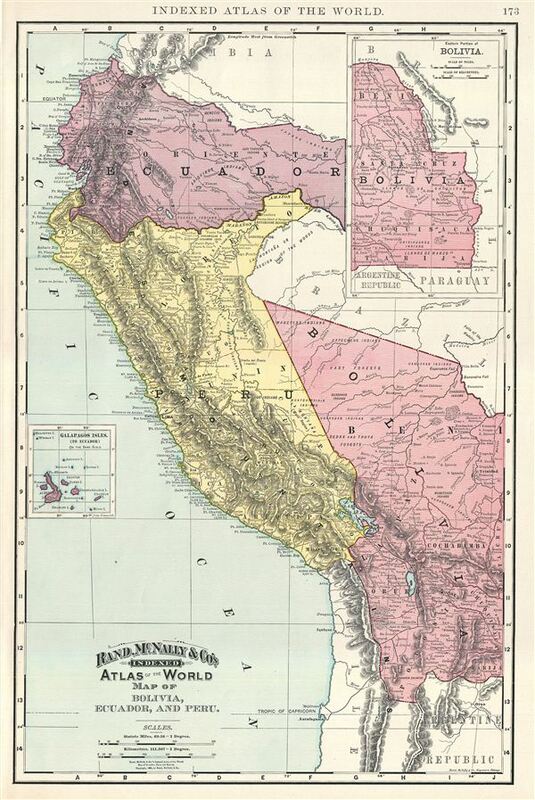 This is a beautiful example of Rand McNally and Company's 1892 map of Bolivia, Ecuador and Peru. It covers from Esmeraldas in Ecuador to Potosi in Bolivia. An inset in the top right quadrant features the eastern portion of Bolivia and another inset near the left margin features the Galapagos Islands. This map dates to a period after the War of the Pacific, in which Bolivia fought against Chile and eventually lost territory, including its access to the sea, and the port of Antofagasta. In the subsequent years, it also lost the State of Acre to Brazil. Several Indian tribes are identified throughout. Color coded according to countries, the map notes several towns, cities, rivers, mountains, lakes and various other topographical details with relief shown by hachure. This map was issued as plate no. 417 in the 1893 issue of Rand McNally and Company's Indexed Atlas of the World - possibly the finest atlas Rand McNally ever issued. Rand McNally and Co., Rand, McNally & Co's Indexed Atlas of the World, (Chicago) 1893. Rumsey 3565.047 (1897 edition). Philip (atlases) 1026 (1898 edition).